English version data logger software is available. The data is stored on built-in data logger of handheld flowmeter, and the software can download the data to PC and then exports them as Excel spreadsheet formation. Now the language version mainly include Chinese,English,French,Portuguese,Italian,etc. If need special language,please indicate it while order,otherwise the goods will be sent at random. (5). Easy and low-cost installation. No need for hole drilling, pipe cutting, etc. (9). Rechargeable battery for 10 hours of operation. (13). Light weight (main unit 1.2lbs). Real handheld type. Handheld ultrasonic flow meter also belongs to a kind of portable ultrasonic flowmeter and can provide abundant capabilities for accurate liquid flow measurement. The utilization of proprietary ultrasound transmission / receiving, transit-time measurement and ultrasonic signal processing technologies allows our flow meter to measure liquid flow rate from outside of a pipe reliably and accurately. 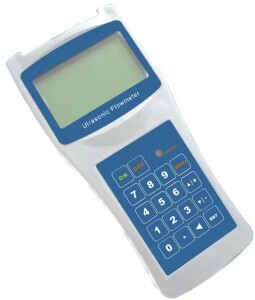 The handheld ultrasonic flow meter is carefully designed so that its user-interfaces are self-explanatory and the instrument is very easy to operate. The unique clamp-on fixture design makes the installation very simple and no special skills or tools required. Due to the non-intrusive nature of the clamp-on technique, there is no pressure drop, no moving parts, no leaks, no risk of contamination, no risk of corrosion, not pressure dependent, and etc. The handheld ultrasonic flow meter is ideal for general flow survey, HVAC hydroponic balancing / testing, energy consumption supervision, water conservation management, beverage and food processing, chemical process monitoring, power plant monitoring, and other closed-pipe applications where non-intrusive measurement is required. Benefited from our advanced digital signal processing technology, the handheld ultrasonic flowmeter works reliably in both clean and opaque liquid flow. Examples of liquids include but not limited to variety of water (hot/chilled water, city water, sea water), sewage and drain water, oil (crude / diesel / fuel), chemicals (alcohol, acids, etc. ), beverage, food, water/glycol solutions, and other liquids. Liquid Temp 32˚F – 212˚F (0˚C – 100˚C) or 32˚F – 312˚F (0˚C – 150˚C),depending on different transducer type. Transducer Cable Standard 2×15′ (2x5m).Longer is available upon request. Transducers Different type transducers optional. Rack Medium Size HM (magnetic with mounting rack).